Pears are rich in fiber and have vitamin C. Likewise, pears are sodium-free, fat free, and cholesterol-free –all things that are important for a healthy heart (1). In fact, in a study that looked at data from the Iowa Women’s Health Study, researchers found that pears and apples were the most protective against heart disease, compared with other common fruits (2). Heart disease is the primary cause of death in the United States, and stroke is the third leading cause of death, according to the National Center for Health Statistics at the Centers for Disease Control and Prevention (3). Heart disease is a general term for diseases that affect the heart or blood vessels. Fats that we eat travel through our blood and are important ingredients that help our bodies function properly. But when we eat too much unhealthy fat, like saturated fat, trans fat, or cholesterol, these fats can accumulate and block blood flow to the heart or brain. This is how heart attacks and strokes happen. According to the American Heart Association, many factors contribute to cardiovascular disease, including diet, activity level, age, and your genes (1). However, eating more fruits and vegetables may help fend off a heart attack or stroke, as fruits and vegetables include a lot of things that are good for your heart, such as fiber and potassium. Since diets rich in fruits and vegetables are usually lower in fat and calories, they can help keep your body at a healthy weight (1). Eating pears may help protect you from strokes, according to a study of Swedish adults, which found that pears (and apples) provided the best stroke protection compared with other fruits (Atheroscleroris, 2013). Similarly, a prospective 10-year study found that eating more white-fleshed fruits and vegetables, especially apples and pears, was associated with a decreased incidence of stroke. A total of 20,069 healthy Dutch men and women age 20 to 65 years were monitored for consumption of green, orange/yellow, red/purple, and white fruits and vegetables. The median consumption of white flesh produce was 118 grams per day, but it was found that for every 25 grams more of white fruits and vegetables consumed was associated with a 9% decrease in risk for stroke. The benefit was suggested to be from flavonoids, a class of antioxidants, and fiber in the flesh of the fruit. 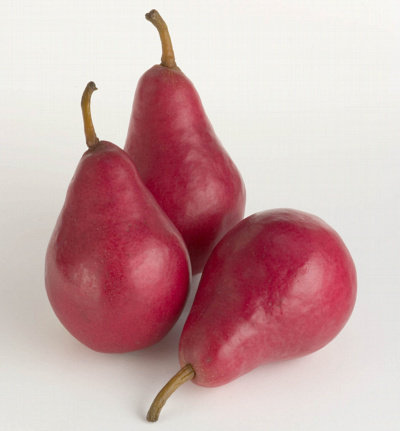 One medium, 100-gram pear provides flavonoids, 24% of your daily fiber, and may protect against stroke. Linda M. Oude Griep, W.M. Monique Verschuren, Daan Kromhout, Marga C. Ocké. Colors of Fruit and Vegetables and 10-Year Incidence of Stroke. Stroke 2011;42:00-00. In an analysis comparing studies of more than 257,551 individuals, increasing daily fruit and vegetable intake was found to decrease risk of stroke. Fruits and vegetables are full of vitamin C, fiber, potassium, and antioxidants. In a study analyzing data from the Iowa Women’s Health Study, researchers found that pears and apples were the most protective against heart disease, compared with other common fruits (Am J ClinNutr, 2007). Compared with individuals who eat fewer than 3 servings of fruits and vegetables every day, those who eat three to five servings daily are 11% less likely to have a stroke. Those who eat more than 5 servings of fruits and vegetables every day have a risk reduction of 26%. These findings support eating more fruits and vegetables every day. He FJ, Nowson CA, MacGregor GA. Fruit and vegetable consumption and stroke: meta-analysis of cohort studies. Lancet 2006; 367: 320-326. In other research, the diets of 90,513 men and 141,536 women were observed and amounts of fruits and vegetables eaten were directly linked to stroke risk. For each additional serving of fruit, stroke risk was decreased by 11%! Although also protective, additional vegetable servings only decreased stroke risk by 3% each. This dose-response relationship suggests that fruit, and fruit and vegetable consumption, decrease the risk of stroke. Dauchet L, Amoyel P, Dallongeville J. Fruit and vegetable consumption and risk of stroke: a meta-analysis of cohort studies. Neurology 2005;65(8):1193-1197. In a study of 72,113 women free of illness, over 18 years 1154 died of cardiovascular death and 3139 died from cancer. The prudent diet was associated with a 28% lower risk of cardiovascular mortality, and 17% lower risk of all-cause mortality. Generally, the Western diet was associated with 22% higher risk of death from cardiovascular disease, 16% from cancer, and 21% of all causes of death. Thus, eating a healthful diet high in plant foods and lean meats may reduce risk of cardiovascular disease and overall mortality. Heidemann C, Schulze MB, Franco OH, van Dam RM, Mantzoros CS, Hu FB. Dietary patterns and risk of mortality from cardiovascular disease, cancer, and all causes in a prospective cohort of women. Circulation 2008;118(3):230-237. In a similar population, 69,017 women aged 38 to 63 years followed either a prudent or Western diet. Those following the Western eating plan on average ate up to 1.5 servings of fruit and up to 3.2 servings of vegetables per day. On the other hand, those following a more prudent plan ate up to 2.4 and 5.3 servings respectively. Overall, those following the Western plan were 1.64 times more likely to develop coronary heart disease (CHD). On the other hand, those following a more prudent eating plan had an inverse relationship with CHD; meaning, the more healthful foods eaten, the lower the risk for CHD. In a follow-up study of 71,768 women and risk for stroke, those who followed the Western diet most closely, had 1.58 times the risk of having a stroke compared to those who ate a more varied Western diet. Likewise, those who ate the most fruits and vegetables had a negative association with stroke. These findings suggest that including more fruits and vegetables in the diet as part of an overall healthy diet is protective against coronary heart disease and stroke. Fung TT, Willett WC, Stampfer JM, Manson JE, Hu FB. Dietary patterns and the risk of coronary heart disease in women. Archives of Internal Medicine 2001;161:1857-1862. Measuring vitamin C (ascorbic acid), the antioxidant vitamin, carried in the bloodstream is one way to assess fruit and vegetable intake. High levels in the bloodstream are associated with reduced risk for coronary artery disease, since it protects against oxidative damage that causes vascular injury. However, past studies have found that long-term supplementation with antioxidant pills did not offer any protective benefits. In a study of 979 individuals with no history of heart attack or stroke, those with the highest intake of ascorbic acid from fruits and vegetables had lower BMI, lower blood pressure, lower C-Reactive Protein (a marker of inflammation), and a higher HDL-cholesterol (the “good” cholesterol that protects against heart disease). Those with the highest levels of ascorbic acid had a 33% lower risk of developing coronary artery disease! This suggests that nutrients found in whole fruits work together synergistically, and offer more protection than supplements. Boekholdt SM, Meuwese MC, Day NE, Luben R, Welch A, Wareham NJ, Khaw KT. Plasma concentrations of ascorbic acid and C-reactive protein, and risk of future coronary artery disease, an apparently health men and women: the EPIC-Norfolk prospective population study. British Journal of Nutrition 2006;96:516-522. Fiber from fruits, vegetables, grains, and cereals may reduce the risk for cardiovascular disease by lowering blood pressure and reducing cholesterol. In a Harvard study of 91,058 men and 245,186 women, for every 10 grams of fiber eaten, a 14% decrease in risk for heart attacks and a 27% decrease in overall risk of dying from coronary heart disease were observed. This research also suggests that associations were strongest for fiber from fruit (30% decrease), followed second by cereal fiber (25% decrease). Pereira MA, et al. Dietary fiber and risk of coronary heart disease. Archives of Internal Medicine 2004;164:370-376. 1. From the American Heart Association Nutrition Committee. Circulation. 2006; 114:82-96. Available online here. 3. Centers for Disease Control and Prevention: National Center for Health Statics, Fastats. Available online here.